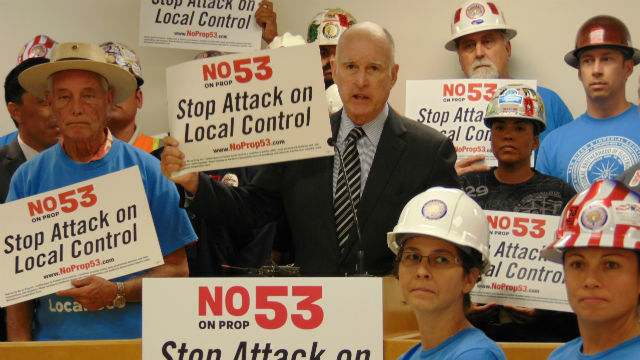 Gov Jerry Brown campaigned in San Diego Thursday to urge a “no” vote on Proposition 53, saying the ballot measure would halt numerous state building projects. Brown said new roads, dams, bridges, water projects and other big investments in public infrastructure would be threatened if the measure is approved. “All those kinds of big efforts take revenue bonds, and Prop 53 is meant to kill revenue bonds,” Brown said at a rally at International Brotherhood of Electrical Workers Local 569 in Keany Mesa. Revenue bonds issued by the state are paid off with revenue from a project, such as tolls on a new bridge. If passed on Nov. 8, the proposition would require voter approval before the state or a local government could issue more than $2 billion in revenue bonds for a project. Brown said California is voting on the proposition because “one guy with a lot of money says ‘no’ to California,” referring to Stockton farmer Dean Cortopassi who opposes a major water project in the Sacramento Delta.